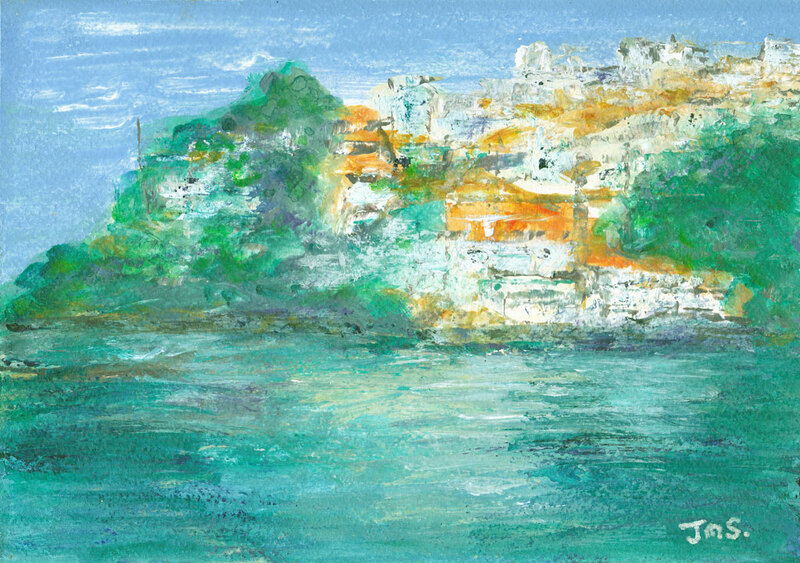 Summer is here in the Northern Hemisphere, and I recently spent a wonderful few days on the lovely island of Skiathos, painting up a storm with my good friend Yvonne, of Painting Skiathos (www.paintingskiathos.wordpress.com.) This little painting was one of the results. We’re back in Koroni now, and although its not very touristy here, we still get our share of summer visitors, so its plenty of beach and relaxation time for us throughout August. Now that I’ve managed to re-organise ‘my studio’ into the corner of our dining room, there should hopefully be some new paintings coming along, and maybe even a long overdue Newsletter.